Make It a Chattanooga Weekend! 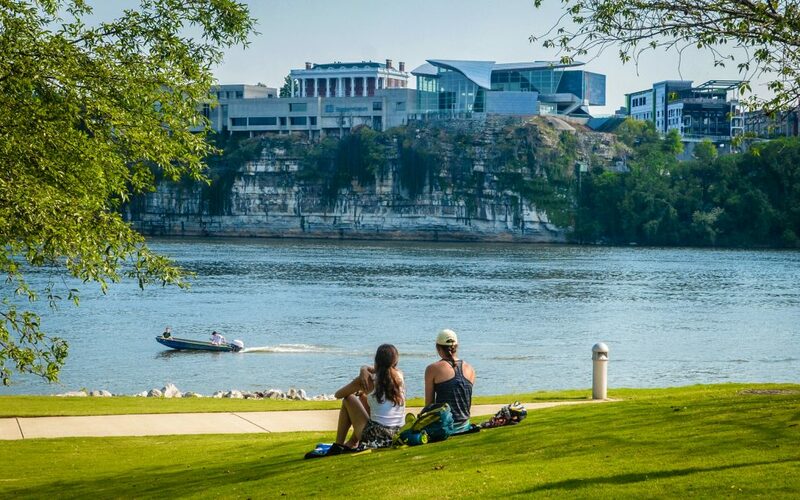 Coolidge Park – Located next to the Chattanooga Theatre Centre, the park includes an interactive water fountain, one of the world’s largest pedestrian bridges-the Walnut Street Bridge – as well as rock climbing, plenty of open green spaces, and a 100-year old restored antique carousel. Hunter Museum of American Art – Located on a bluff overlooking the Tennessee River, the Hunter is directly across from the Chattanooga Theatre Centre. showcases 100 years of architecture and houses the finest collection of American art in the Southeast. The collection of the Hunter Museum spans the history of American art from the colonial period to the present day, and covers a wide variety of media including painting, sculpture, contemporary studio glass, and crafts. Public Art – Along so many of the public sidewalks, parks, and alleyways, Chattanooga presents a wide assortment of sculptures, murals and other forms of artistic expression. Creative Discovery Museum – One of the nation’s top children’s museums, the Creative Discovery Museum inspires children’s passion for learning through play. Nightfall and Riverfront Nights – During the summertime, downtown Chattanooga becomes a street party. Friday nights at Miller Plaza are all about Nightfall concerts, while Saturdays belong to Riverfront Nights at Ross’s Landing, just across the Tennessee River from our facility. Tivoli Theatre, Soldiers & Sailors Memorial Coliseum and Walker Theatre – Chattanooga is blessed with three beautiful historic theaters, all located in the heart of downtown. Bessie Smith Cultural Center – presents the many contributions African Americans made to the development of Chattanooga and pay homage to the late “Empress of the Blues”, Bessie Smith. Bluff View Art District – A creative haven that specializes in the visual, culinary and landscape arts. As you can probably tell, it’s easy to spend a full week here and not see and do everything that’s available. For those who live in the region, we hope your visit to see a Chattanooga Theatre Centre production is just the beginning of your love affair with our wonderful community!